By Sophie Dutertre, Centre for Culture, Ethnicity & Health & and Dale Park, EMR Alliance. The benefits of culturally specific social support groups are well documented, but what happens when these limited groups don’t have availability, don’t exist for all language groups, don’t offer the activities to suit everyone or people prefer to be part of a group outside their language or cultural background? These important questions lead the EMR Alliance to ask: how could “mainstream” English speaking Social Support Groups (SSG) build culturally inclusive and welcoming environments for people who speak little or no English and were there good examples where this was already taking place? The next steps involved meeting with the program coordinator to find out more about their group, how they operate and why they were successful. After the initial meeting, Dale was convinced there were things that could be learnt from Uniting Care East Burwood. “Speaking with the program coordinator Denise, I knew their journey could help others working in this space. When Denise talked about what they did, it seemed so simple. I thought we could create something practical that can help others do what Denise and her team have done.” he said. In creating a resource to help “mainstream” SSG be culturally inclusive, it was important to hear from service providers already working in this way, their clients and Access and Support staff who help connect CALD people to services. It was also important to understand “mainstream” providers fears or concerns so the resource could attempt to address these. The EMR Alliance engaged the Centre for Culture Ethnicity and Health (CEH) to undertake the six-month project involving research, consultation and resource development. During the consultation, it became evident that Uniting Care East Burwood was not alone in providing person-centred and culturally inclusive SSG’s for CALD people. “Observing MannaCare, it was impossible to know who the clients with dementia were and who the volunteers were, they were all active and participating, it was fantastic.Mountain View Cottage at Whitehorse Council also has an autonomous SSG: the clients decide what they want to do, they budget and plan for the activities and the staff are there just to facilitate the session. It’s very forward-thinking” said Sophie Dutertre CEH Project Officer. These flexible approaches not only support clients to be engaged in the group; they helped overcome potential language barriers by taking a strengths-based approach and focusing on activities and interest, as opposed to deficits. The research clearly highlighted that activities make or break groups and that understanding a client’s interests and hobbies can overcome possible language barriers. It was noted that activities that require little language, such as gentle exercise and chess, can be drawcards. While some activities such as bingo or footy tipping may be seen as very “Australian”, Tai Chi and Qi Jong have now become “mainstream” and may help to attract CALD and non-CALD/”mainstream” participants. The project also found that SSG’s who successfully integrated CALD participants into their groups had successful partnerships with CALD communities, engaged CALD volunteers, supported their staff to improve their cultural competency and let clients make decisions and be autonomous. CEH had successfully created “Help Sheets” for other health and wellbeing resources and had found this format to be an appropriate way to convey messages. Eight help sheets were created with tips, case studies, quotes and resource links. The designer used for the Connecting the Pieces animation was employed to provide a bright, engaging and coherent resource, which has been made available for free on the EMR Alliance and CEH websites. 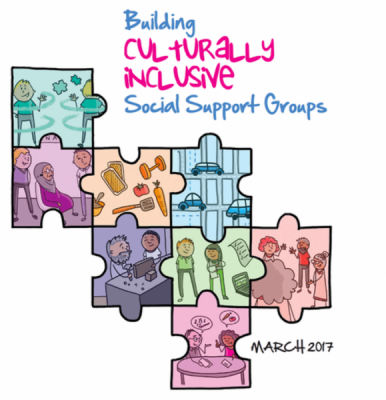 This project and resource demonstrate practical ways in which mainstream social support groups have built culturally inclusive and responsive environments. They articulate how a person-centred approach that is solution-focused, flexible, empowers participants and looks beyond their language and cultural diversity is necessary to achieve an engaging environment.